In season two, Discovery abruptly wraps up its sibling angst to focus on Michael getting killed in the most painful way possible. Most storytellers know they shouldn’t add slapstick to a tragic death scene or stuff explicit violence in a romantic comedy. That’s why I have only one article with tone guidelines. But recently I’ve noticed a spate of popular stories hindered by a bad tone choices. Since this surely isn’t the last we’ll see of these issues, let’s have a look at how both dark and comical elements can hinder a story. The Orville Season 1* is what happens when you take a guy who’s spent over 15 years making crude animated comedy and give him a bunch of money to make his own self-insert Star Trek fan fiction. Literally, that is what happened. The dude’s name is Seth MacFarlane, and after so long making Family Guy, anyone could have expected his transition to a Trek-like show to be rough. Before the current run of Star Trek: Discovery, Star Trek depicted an optimistic future: Earth is a utopia, humanity has nearly reached its potential, and all the conflict comes from the greater galaxy. 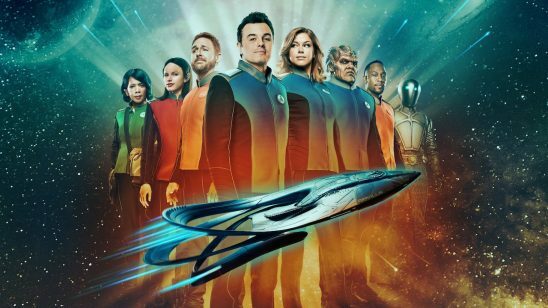 The Orville has at least succeeded at this light optimism, earning it fans who are tired of constant grimdark shows. But Star Trek was also meaningful, and The Orville can’t do that as long as it keeps shooting itself in the foot with crude humor. In The Orville’s episode Krill, the pilot, Gordon, and the captain (played by MacFarlane) go on a dangerous undercover mission on an enemy ship. Or at least, it’s supposed to be dangerous. MacFarlane adds so much awkward social humor to their conversations with the locals, only a two-year-old wouldn’t notice Gordon and the captain are alien infiltrators. As it becomes clear the protagonists won’t be discovered no matter what they say, the tension goes out the window. What’s more, the protagonists are supposed to be trained professionals, but they just come off as incompetent. Who would send these people on any mission? Apparently in our optimistic future, people don’t get ahead based on merit. In the episode Pria, Gordon tries to teach the android character about practical jokes. Not understanding what is funny and what is too far, the android detaches Gordon’s leg while he’s sleeping and hides it on the ship. Obviously this isn’t okay, and Gordon doesn’t find it funny at all – but at the same time, the audience is supposed to think this violation of his body is hilarious. To be fair, Gordon is a terrible person, and I want to laugh at his pain. But then I imagine Captain Picard from Star Trek: The Next Generation giving me his disapproving look. Picard and the crew of the Enterprise had their jokes, but they would never have treated a human being that way. Being the defenders of peace and sapient rights in a meaningful world is simply incompatible with cheap cruelty. The episode continues, and the leg stays hidden until the worst moment. MacFarlane’s character has just learned the woman he’s fallen for has captured the ship and its crew. He’s in the middle of confronting her about this when Gordon’s leg comes crashing down from the ceiling. Sure, it’s worth a few laughs, but those laughs come at the cost of one of the episode’s climactic scenes. Viewers finally have a riveting moment worth investing in, only to be reminded that they’re watching a silly story. What’s more, any scene with a serious tone could be have worked for this falling leg joke. Why not use the leg when MacFarlane was trying to impress the episode’s hot villain? If you’re wondering why MacFarlane would make such weird choices, I can guess: he wasn’t confident in his ability to engage his audience without humor. He assumed everyone would get bored during the serious stuff, and only a leg descending from the sky would keep their attention. If he hasn’t learned better already, I think he will. 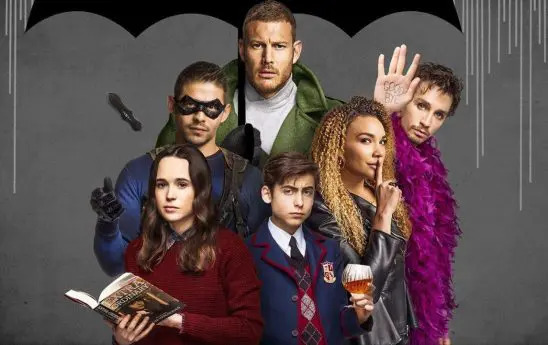 Umbrella Academy is a new Netflix show based on a comic book series. Because they are drawn, comic books tend to have their own aesthetic and tone. What feels flashy and engaging in a comic book can feel overly tacky or campy once it’s in a modern live-action format. While viewers have gotten more used to the camp involved in the superhero genre, studios often make significant changes to costumes and other elements to better fit the gritty, realistic look of today’s filmed stories. Enter Umbrella Academy, where the showrunners seem determined to embrace not only a stylized campy feel but also gritty realism. The show is about a group of siblings with powers who were all adopted by an eccentric billionaire. In early scenes, we see the wacky guy offering to buy someone’s miracle baby, followed by a set of seven identical nannies that look like they came straight out of the fifties, pushing seven identical strollers. We get the feeling that this show is somewhat dark but also playful and surrealist. Then the show transitions to grit town. We see the heroes are disenchanted adults with real lives and, in many cases, struggling with relatable real-world problems like failing careers, broken relationships, and substance abuse. Their eccentric father has recently died, and they struggle just to gather and discuss it civilly. It’s enough to make you forget that earlier wackiness, until suddenly there’s a talking chimp butler amid all the discussions of their fractured lives. Many stories have lifted the veil of superhero glamour to expose the messed-up lives that heroes are leading, but the glamour and the reality should feel like they can exist in the same world. In Umbrella Academy, we meet a woman who feels deep regret that she used mind control on her young daughter in order to quiet tantrums, and she has lost custody of her daughter as a result. Then we have to imagine that she used to stop bank robbers by putting on a silly costume, walking right up to a guy with a gun, making an exaggerated pose that resembles whispering in his ear, and saying, “I heard a rumor that you shot your friend in the foot.” And of course this guy stands there listening to her while she does this. The mix of tones also creates confusion about how audiences should react to elements in the story. Unsurprisingly, one of the siblings is a dude with a really overbuilt chest, shoulders, and arms. When he gets into a brawl with one of the villains, his shirt comes off, showing just how big and hairy he is. Seems like another day in superhero land, but then all of his siblings stare at him, and he looks really awkward under their gaze. I was confused about this for quite a while. I finally figured out that his siblings didn’t previously know he was that hairy, and this is supposed to shock them. If the show was consistently gritty and realistic then that might fit, but as is, his big hairy shape is the least weird thing I’ve seen. Either of these two tones could work well on screen, but they don’t play well together. They set different expectations about what is in the world and how seriously the audience should take the events they’re witnessing. As is, the clashes often feel confusing, jarring, or just implausible. This bestselling YA book just came out in 2018. 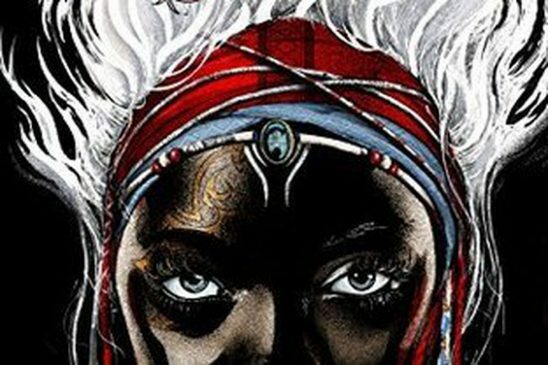 Author Tomi Adeyemi paints a colorful world full of internal strife. The main character has white hair marking her as a diviner, people who once would have been mages but lost their powers. Now there’s an oppressor on the throne who is demanding heavy taxes from every diviner, and if they can’t pay, they are sent to labor camps where they inevitably die. It’s a very dark conflict, but the main character, Zélie, is at the center of it, and she’s ready to fight to turn things around. Altogether, the novel starts off quite strong. 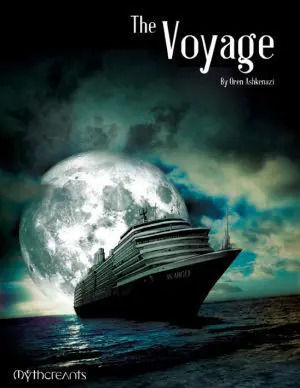 Unfortunately, as the book progresses, there’s an increasing disconnect between the super dark elements Adeyemi clearly wants to be present and what actually goes into the plot. The first chapter gives us an early warning. 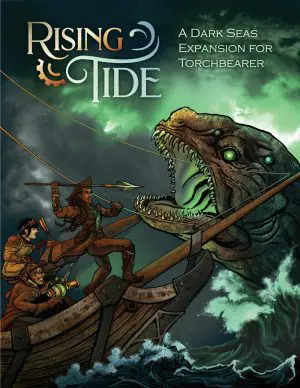 Zélie’s fighting mentor, a woman who teaches young diviners to resist the oppressive regime, tells her students that they are learning to use the staff because it is nonlethal. This is strange not only because staves are absolutely lethal, but also because when you’re facing genocide, it’s not a good time to be concerned about hurting your oppressor. A couple chapters later, we discover the mentor taught Zélie to make bombs. How nonlethal. During the novel, Adeyemi kills characters left and right – as long as they’re insignificant. Zélie’s town is burned down, barbecuing a bunch of nameless people. Another viewpoint character, Amari, watches a friend who’s never been on screen before get murdered by her father. The shopkeeper that helps them resupply is murdered afterward for having done business with them. Later in the book, an entire group of fighters working for Team Good are slaughtered, only to be conveniently replaced with another group of fighters. Despite this heavy bloodshed, all the important characters seem to have plot shields. When it comes time to part with Zélie’s ailing father and sage mentor, characters we’ve had time to care about, Adeyemi assures us they’ll be just fine. Team Good regularly escapes fights without any kind of significant injury, staying perfectly intact – until it’s time to visit torture town, of course. * Some of these characters lose their plot shields at the end of the book, but after so long keeping them out of harm’s way, it feels just as out of place. The book even has some chapters about an arena where large numbers of enslaved diviners are forced to fight each other to the death every day. The arena is filled with water, and the diviners are separated into teams for each boat, then the boats fight each other until everyone either dies of an injury or drowns. It’s just as terrible as it sounds, but there’s a potential prize for winning that Team Good needs, so they enter the competition – with diviner slaves of their own! Team Good promises their slaves a cut of the gold that comes with the prize, but they still make them fight. Surprisingly little hand-wringing or remorse is expressed over how they are killing tons of innocent slaves to reach their goal. Not to mention, since the heroes have an artifact that can at least temporarily give powers back to diviners, just attacking the dude that’s arranging this horrible thing is definitely within their power. How Adeyemi describes fights also creates a separation between the tone she has and the tone she seems to want. They read like a cartoon battle where the villains conveniently pause for the heroes to get away unscathed, and all the good guys manage to fight without spilling blood. For instance, at one point Zélie and Amari are completely surrounded by enemy guards. Then Zélie’s brother jumps into the middle of this on the heroes’ cat-mount, they climb on, and the cat jumps away. What are all the guards doing while they are climbing on? Nothing, it seems. Later, a small group of mercenaries allied with Team Good take over an imperial battleship in five minutes without killing a single person. Dark elements make stories unpalatable for some people and less enjoyable for many others, so they need to offer something to the story, whether it’s realism, tension, or meaningful commentary. This superficial darkness offers none of those things, but still manages to be unpleasant. Overall, it feels like a light story slathered with grimdark sauce. To be fair, this is Adeyemi’s debut novel. If she wants to improve in this area, she surely will. 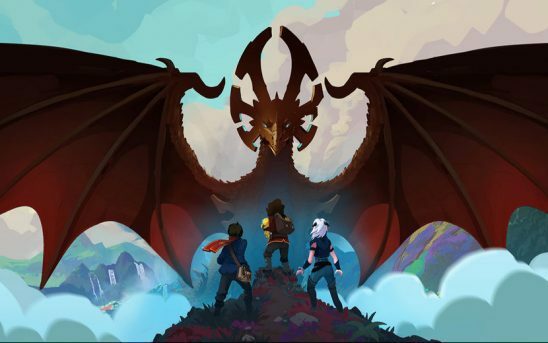 The Dragon Prince is the new Netflix animated series by two of the three creators of Avatar: The Last Airbender. The Last Airbender had a great cast of characters, including a comic-relief character named Sokka. When he wasn’t doing strategy and logistics for Team Good, Sokka would act silly and make lots of jokes at his own expense. His style of peppy, self-deprecating humor made him both fun and sympathetic. Fast forward to The Dragon Prince. The show’s designed for a more mature audience, and it features a morally gray conflict between humans and elves. The show hints that characters who are designed to feel sympathetic are also doing immoral things. And yet instead of having one character defined by Sokka-style humor, now everyone is Sokka! Okay, not everyone, but a large portion of the cast is making Sokka jokes to varying degrees. It actually works with the most central character of the show, Callum. Like Sokka, he’s supposed to be a sympathetic underdog. It’s a lot weirder with the antagonists. For instance, Lord Viren is the primary antagonist of the series so far. His goal is to seize a throne and start a war, and he has powerful dark magic he can use to accomplish this. But one moment he’s slick, and then the next he’s got humble and awkward Sokka humor. If he can’t even get through a conversation without embarrassing himself, how is he supposed to feel like a threat to the heroes? In a show that’s already struggling with consistent character depiction, these kinds of jokes further weaken the characters. For instance, Team Good also includes Rayla, the elf assassin. Despite her formidable training in combat, in the first episode she somehow forgets what a whetstone is, just so she can goof off by calling it a “thingy.” Moments such as these are not only implausible but also reduce the distinctiveness of the cast, making everyone blur together. The Sokka problem is at its worst when it’s time for an emotional moment. For instance, Lord Viren orders his son, Soren, to kill the heroes. Since Soren is Sokka pretty much all the time, he agrees without breaking a sweat. Later we see him hatch schemes to kill the protagonists, still in light and silly Sokka mode. Finally in season two, after he’s injured and can’t be a warrior anymore, he declares that he’s actually glad because he felt torn about killing the heroes to please his father. Wait, what? He never looked torn. Come on, writers, even Sokka was unhappy sometimes! How can the audience get invested in a conflict if the characters themselves don’t seem to care about it? Callum, the true Sokka heir, does a better job at showing multiple sides to his personality. * In season two, we get to watch him fall into a dark-magic-influenced dream. There he has a very personal battle against his temptation to use dark magic. He overcomes his temptation, and then a goofy side character jokes about how everything is just his silly dream. With that one line, a great moment becomes almost meaningless. 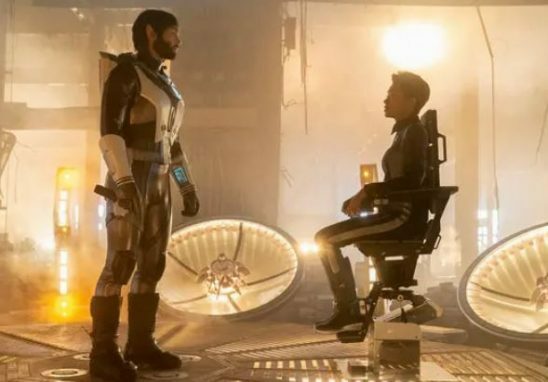 In an era where every filmed story is grimdark whether we like it or not, Star Trek: Discovery has been one of the biggest disappointments to come from that trend. As I mentioned earlier, Star Trek set itself apart by being utopian and idealistic. The TV shows that are most popular among Trekkies, The Next Generation and Voyager, are especially optimistic. Both shows had upbeat slice-of-life scenes to show viewers what the characters did every day. They also had big reset buttons that were used between episodes, so no matter what damage was inflicted on ship and crew, it was gone by the next story. If that sounds melodramatic, it’s because Discovery is melodramatic. The main character, Michael, seems designed for maximum angst. Her straight-faced Vulcan upbringing means that when things go bad she looks visibly upset, but when things go well, she doesn’t look that happy. Every season she is given backstory to brood over. The show tries to squeeze maximum tension and drama out of every scene and even every line of dialogue, to the point where the characters often sound unnatural. The show relentlessly follows a tense season throughline with very few side trips or breaks for viewers to rest and catch their breath. The senior officers can’t even have a private meeting without a spinning camera and dramatic action music. When there isn’t anything that would reasonably create angst and tension, the writers manufacture something from thin air. Michael’s reason for brooding in season one is that she supposedly caused the Klingon vs Federation war, but viewers get to watch the inciting event, and she absolutely did not cause the war. She failed at what she was trying to do, so her actions had no impact. In season two, we witness a flashback fight between Michael and Spock that is too underwhelming by far to justify the angst they spend on it. And an angsty Spock? That’s stretching belief. This nonstop misery ride is an issue not only because it’s a bad match for the franchise and its fans, but also because audiences get worn out after a while. Variety in a story maintains interest; too much of the same loses it. Plus, important scenes aren’t as exhilarating when every other scene is dialed up to eleven. If the show’s creators want great emotional moments, they should build toward them instead of immediately opening the floodgates. The overly dark and melodramatic tone of the show is especially strange considering that the show’s makers seem to know that fans want something different. Before season one, they talked to the media about how deep and complex their Klingons were and then gave fans evil caricatures. They advertised how they had a gay couple just hanging out together, being gay, and then buried one of them. Thankfully, they were compelled to undo that last blunder in season two, but of course, they’ve made the reunion as tortured as possible. The trailers for season two seemed to signal they’d gotten the message that the show should be lighter. But while they’ve added a few more jokes, altogether the tone hasn’t changed much. In episode nine of the season, viewers are teased with several tiny clips of happy scenes from someone’s memory, in service to a contrived story about killing off someone in the B cast. It feels like the show’s creators are just taunting us now. What’s probably happening is that they like the idea of including happier, lighter moments, but they’re not willing to spare any time from their grimdark agenda to do it. But they should definitely make this leap, because the few times we’ve gotten lighter spots from them, it’s been fantastic. One of the very few lighter one-off episodes, Si Vis Pacem, Para Bellum, is probably the best episode of season one. Season two has Jett Reno, a new member of the B cast that engages in light banter, elevating all the scenes she’s in. Discovery’s creators can fix this if they want to. Tone problems are often difficult for audiences to identify. Without understanding why, they’ll lose enthusiasm for a story they would have otherwise enjoyed. Because storytellers can’t rely on precise feedback on this issue, it may take a proactive approach to ensure scenes are offering some variation in tone while still following a consistent vision for the story. I haven’t seen season two; you can tell me about it in the comments. It seems like every grimdark story these days has a torture scene. These scenes normalize torture and usually spread myths that create public support for torture. Though he also belatedly declares that magic is everything to him. I haven’t seen/read any of the other stories you mention in this article, but I wholeheartedly agree with your take on Discovery. I don’t think you guys have written a lot about Discovery yet, so I am glad to hear your opinions. I am usually totally at a loss about what the writers wanted to make me feel during a scene, the jokes that should lighten the mood feel incredibly out of place, and the comic relief characters (like Tilly) would be much more likeable during scenes with less tension, of which there are few. During every episode I watch I wonder what you may have to say about it – I mean, the storytelling problems start in the first scene of the first episode, with the incredibly stilted expositionary dialogue, and never really let up. I feel that reading Mythcreants a lot has helped me identify what isn’t working. Nevertheless I get the impression that everybody appears to like the show a lot more than I do… or hate it for representations of women and minorities, one of the few things I find positive about it. We certainly don’t hate Discovery, we’ve watched far too much bad Trek for that, and Discovery has a long way to go before it’s as bad as Enterprise. But we do find Discovery frustrating, primarily because of how insistent the creators seem to be on forcing grimdark into their story even when it doesn’t make sense and actually hurts the plot. 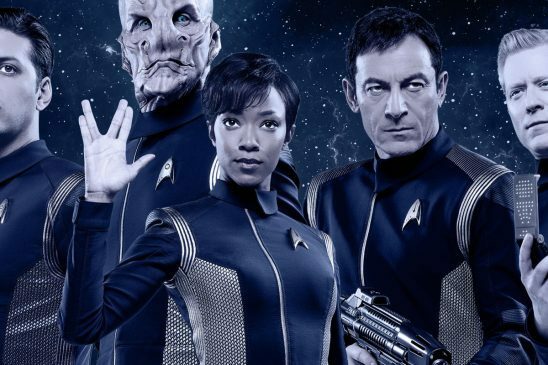 Unfortunately, there are so many people out there who do hate Discovery simply because it stars a black woman that critiquing it objectively can be difficult. I haven’t seen all of Enterprise yet, but yeah, there is a lot of bad Trek episodes in all of the series. Especially the first 2 seasons of every one of the modern shows were uneven to say the least. Discovery just happens to be the first I am seeing “in real time” and not binging years after release, and I try to keep this in mind. Who knows, in 15 years I might be the one to tell people to stick to it because it later becomes the greatest Trek show ever. So I do try to keep an open mind. I guess my main problem is that I keep thinking: “You could have done this so much better”! And I am still waiting for a character I really care for, right now I am indifferent toward most of them (including Burnham) and actively hoping for some to disappear (which I don’t think is intended by the writers). I agree that there is not a lot of objective critique of Discovery, and searching for some may leave one genuinely disgusted, so thanks for not giving hateful opinions (often disguised as “edgy”) any room here on Mythcreants. You’re doing a great job. “You could have done this so much better” is our most repeated phrase when watching Discovery. We like a lot of the characters, it just doesn’t seem like they’re given the material they need. I liked s1 of DISCOVERY (have yet to see any of s2), but only after watching the whole thing. I think the makers of it have a difficult choice, to either make something similar to THE ORVILLE, or something a bit more “original”. It looks like they went for the 2nd option and in the process alienated a lot fans. Another way of looking at this is that DISCOVERY continues on a low-key reboot that ENTERPRISE started with its “temporal cold war”. ENT had major issues with continuity and got around that in part by having unnamed Ferengi and Borg. In any case I guess what I’m saying is that in tone DIS is more like ENT than any other Trek show. There were some disappointments for me, including the killing of one member of the first “official” gay couple in Trek (at least one fan film has Kirk’s nephew as being gay). A lot of of the more vocal fan objections were about the look of Klingons and the the very non-Prime directive style of Captain Lorca, but first may not entirely matter, and second is explained in the season arc. And why bother with this? I think the huge problem that CBS had was that the previous Trek shows (except perhaps for ENT) were two successful. For example, a local free-to-air channel routinely shows NEXT GEN and VOYAGER on close rotation on weekdays, and the ORIGINAL series on weekdays during school holidays. That makes it easy to watch and easy for even the casual watcher to to know the “lore” of Trek. And under such circumstances, where folk can watch it for free or see all of it one way or another, it’s hard to make something new that doesn’t either redo something previously done, or violate either continuity or “Trek Lore” (like the Prime Directive. I don’t know what I’ll see in s2, but I will see it one day. In the case of Umbrella Academy, I agree that the tone can be sometimes confusing (I’m thinking about toward the end when a certain love interest is threatened to be dropped into a pool of acid with cheerful music in the background). But I wouldn’t say that Luther’s body and the monkey butler are really tone breaking. Everything related to their past is wacky, cheerful and over-the-top like a comic book. I see it as some kind of golden days where everything was happier on the surface. When you’re in the present, everything is kind of dark and kind of grounded. I’ve seen the monkey butler as a last vestige of “the good old days”. Giving that he is usually serious and act as kind of a glue holding the group together in the first couples of episodes, i think he’s working pretty well with the themes of “Wacky superheroes having to cope with the real world”. As for Luther, I’d say it’s a case of body horror. When you see in the flashback, he has a normal body. That’s the body everyone was accustomed to seeing. The shock came from the fact he now has the body of a gorilla. Since they all knew him most of their life and nobody knows what happened to him, they were shocked. But I concede that it could have been better shown to the viewer. (It took me a while before I understood it was a Gorilla’s body and not just a very hairy dude). I haven’t seen the series yet but I have reread both comic collections of this recently, and it was very clear to me just who they were referring to. I’m hoping the adaptation is done right, and reading “We get the feeling that this show is somewhat dark but also playful and surrealist. Then the show transitions to grit town.” it seems like it is! When it comes to Discovery, we like it overall even though it definitely has problems… BUUUUUUT the last ep we watched was SOOOO bad. I’m not sure if and if so how much Swedish Netflix lags behind with Discovery, but it was the ep where they made the plan to capture the Red Angel through threatening Michael with death. Plus Airiam, the cyborg crew member, died. First, the plan to capture the Red Angel was stupid. Possibility two: Time is one-dimensional, no branches, just a single line. In that case, the Red Angel should remember everything about their plan to trap her, since RA/Michael was there and talked it over, and so already know what they’re planning. They should really take that into account! Michael will definitely not end up dead in this scenario, but she might be saved from death in a different way than they had planned. Then… The death of Airyam! Cyborg Lady had been an absolute NOBODY until they decided to kill her off. So in order to make that moment emotional, they suddenly CRAMMED in “look, Airyam had a deep and interesting love story with her husband, look, Airyam was really close friends with the characters we DO care about in the show, look, she’s NOT a red shirt!” and then they kill her. It doesn’t WORK that way! The death of Ariam is one of the show’s lowest points so far. It’s not in service of any arc beyond piling another thing for Burnham to be sad over, and it’s a character fans were interested in but had no real development before hand. Plus it was so easily avoidable in the story. How about you open the door, then when she’s sucked out into space, beam her into a holding cell? We know you can do that! Full disclosure: At the moment I have no Netflix account so I’m not up to date with what is going on in Discovery. I was shouting at my screen for them to save Airiam. I admit i am a bit sad – but because they wasted what could have been an interesting character. But in all honesty the moment she got so much screen time I thought “Yeah, she’s dead.” and then I hoped they would not go that route because it feels so lazy. I also find Michael’s depiction very strange. I’m baffled that she could not women up and push Airiam into space (which was forced an unnecessary in the first place) despite her Vulcan upbringing and her status as the main character. And it is not the first time that Michel seems to crack under pressure. But while I cheered for Nhan, I find I strange that Burnham is a commander who seems not up to the task. I find that sad because I want to cheer for Michael Burnham, but she almost seems self-sabotaging by now (at least to me). And then is the big thing: Airiams Death and Michaels Breakdown could have been avoided if Michael would have been allowed to save Ariam by beaming her into a holding cell – Michael could have saved the day, a friend and triumphed against the odds. Side-not: Does somebody else feel that checking a recording via infrared or ultravilet-vision for holograms should be a standard and not some wild “Saru the Genius figured it out”-Moment? I have to admit that I’ve been liking s2 a lot more than s1. S1 was cute but the anachronistic quips by Gordon and others – clearly meant for the viewers rather than the other characters – annoyed me. Both S1 and S2 have been broadcast on free-to-air here in Australia on SBS VICELAND and I’m enjoying the 1 episode a week (or even less frequent) format. I think a lot of inconsistencies in tone in the first season have been ironed out. A number of episodes in s1 are clearly now setups for episodes in s2. The “practical joke” subplot came back to haunt the crew in the 2 part Kaylon story. Mercer and Gordon’s mission on the Krill ship spawned a revenge story. But with a much longer season, they can do exactly that in s2. And I think that by s3 ORVILLE will start being its own creature far more than an obvious homage/parody of Trek. Oh gods Discovery. I’ve only seen a few episodes but I can see the issues everyone has with it. It is like the writers went “I heard you like grimdark, so we’ll give you more grimdark!” Diversity of stories is a good thing, and most of what distinguished Star Trek from other series in that genre seams to have been lost in Discovery. I had to stop watching Amazon’s recent original “The Tick” series because of the tonal dissonance.